Today we have an exciting giveaway from a Clemson alum owned, new business, So Jennifer Boutique – an online boutique offering women’s and children’s custom skirts and little girl dresses. 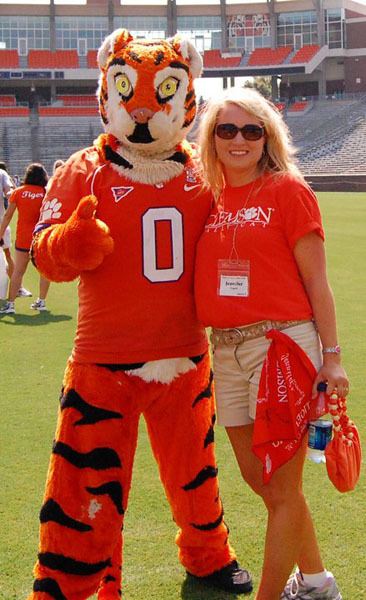 First, meet boutique owner Jennifer Capell – a ’97 Clemson alum who majored in Accounting. She was a Clemson Rally Cat her Junior and Senior years. She told us that she love, love, loved cheering on the Tigers and that being on the football field and the basketball court was exhilarating. She says that now her heart sings whenever she gets the opportunity to get back to campus and be surrounded by orange, purple and the Clemson spirit! Jennifer is in a house divided – her husband roots for that other South Carolina team – and she has two children that she’s raising as Tiger fans, although she says her son will sometimes root for the Gamecocks…but her daughter, Ashlynnn, is a Tiger fan all the way! Her daughter Ashlynn was Jennifer’s inspiration to start So Jennifer Boutique – Jennifer was always on the hunt for cute outfits for Ashlynnn and eventually decided to learn to make them herself, despite never having sewn a stitch in her life. After a few sewing classes, Jennifer discovered she had a new found passion (and talent) for creating cute new outfits for Ashlynn, and then eventually for herself too. One day, Jennifer ran across this orange ruffle fabric. She immediately thought about Clemson and how fun it would be to make a skirt for Ashlynnn in Clemson colors using the fabric. 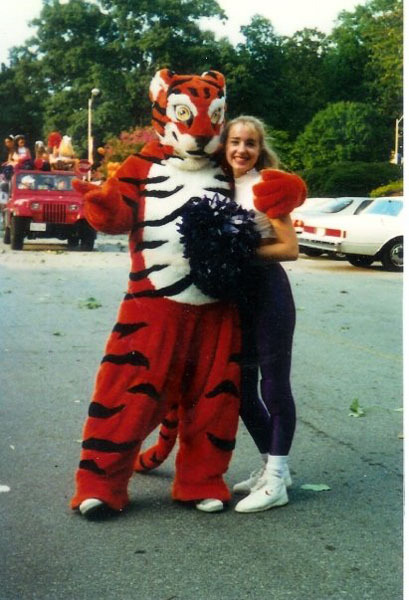 So with the orange ruffle fabric and a purple elastic waistband, the Clemson Ruffle Skirt was born. Jennifer continued to come up with more skirt designs and soon started creating dresses and other unique outfits – so she created So Jennifer Boutique to be able to share her cute designs with everyone. 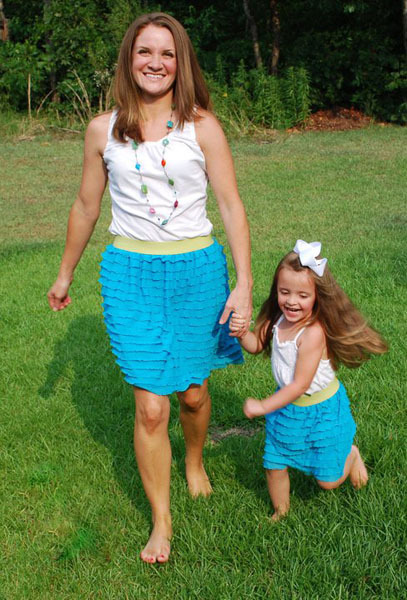 So Jennifer Boutique’s hottest item is of course the ruffle skirt – available in toddler, youth AND adult sizes. Skirts are custom made to you or your child's measurements. They are available in orange and in purple of course – but you can also get it in other colors. How cute is the matching mother and daughter skirts!?! You can also get the ruffle dress – available in long sleeve or short sleeve. How cute is Jennifer’s model – her adorable daughter Ashlynn!? 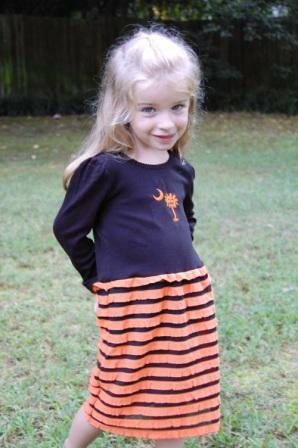 In addition to getting your little Clemson Girls into the Clemson spirit, get them into the Halloween spirit – check out this super cute Halloween Palmetto ruffle dress. So Jennifer Boutique will soon have Christmas outfits added to the store…so make sure you follow the boutique on Facebook so you will be the first to know when they are available. So Jennifer Boutique also sells pillowcase dresses, A-line dresses, and A-line skirts for sizes 12 months to 6 years. Of course all the items are available in Clemson colors (and that other team’s colors…), but every style you see can be customized to the color combination of your choice. You can shop So Jennifer Boutique through the Etsy shop or place orders directly by email (sojenniferboutique@gmail.com) or by phone (803.546.9109). Follow So Jennifer Boutique’s blog and Facebook page to stay up to date on new designs, sales and promotions, etc. 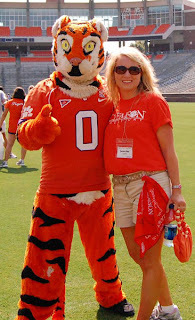 Jennifer would like to give one lucky Clemson Girl reader their very own orange ruffle skirt in a size of their choice (any size from 2T up to Women’s – custom made just for you or your little Clemson Girl). NOTE: Due to the customized nature of this prize, prize will take 2 to 3 weeks to be delivered to winner. Comment on this post with your first name, last initial, and where you are from (1 entry). 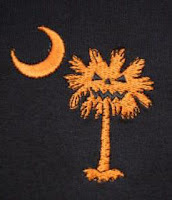 ‘Like’ So Jennifer Boutique on Facebook and post on the wall “Clemson Girl sent me” (1 entry). Tweet about this giveaway on Twitter – include a link to this post and copy @clemsongirl (1 entry). Email a link to this giveaway to two friends, copy us clemsongirlblog@gmail.com (1 entry). Deadline for all entries will be tonight at 7pm EST. We will compile all of your entries, randomly draw a winner and announce the winner’s name back on the blog around 8pm EST. The winner has 48 hours to contact us or we will draw a new winner. Special thanks to Jennifer and So Jennifer Boutique for sponsoring this amazing giveaway today! We love supporting Clemson alum owned businesses! Go Tigers!! I shared on facebook. Good luck everyone! I shared on FB about the giveaway!! Oh my....love the ruffles! I emailed this to all my Clemson friends!! Also tweeted about it!